Lego toys have brought a whole new level of fun and entertainment in our lives with the introduction of Lego Boost. 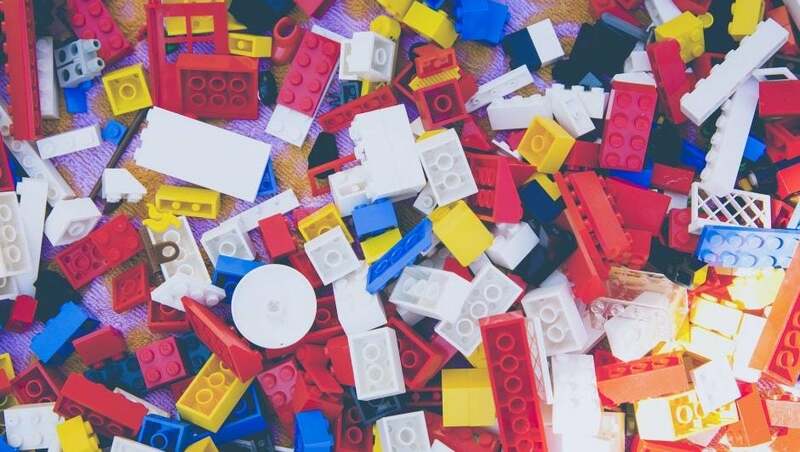 Since Lego was invented a century ago by the Danish Ole Kirk Christiansen, Lego has made billions of children happy and has even enabled millions of adults to escape the boredom of daily life. Now, in the modern age, Lego has radically transformed the way we play. Yes, we still have those Lego pieces all around us, but thanks to the advancements in technology we can finally enjoy a new, revamped Lego. We’re talking about Lego robotic kits. Lego robots have just hit the market at CES 2017. Led by Lego Boost, a creative toolbox of Lego robots, this whole new concept has gone mainstream and is poised to take over the toy industry. This new Lego robot takes the Lego education to the next level, enabling kids and adults alike to bring blocks and pieces to life. However, Lego Boost is much more than just a kit for building Lego robots. It is an instruction manual that literally teaches users how to program their robots to do certain tasks. Being designed for kids ages 7+, this new Lego education kit will be available starting August 1st. However, until then you can get it at a great price by pre-ordering it here. In this Lego Boost review, you will get to discover every single detail about the new robotic educational kit and you will also understand how you can use this highly-advanced technology to make your children days’ brighter and more meaningful. So What Is Lego Boost? In simple terms, Lego Boost is a complete set of creative toolbox that includes over 840 original Lego pieces, a move hub, rotating motor, building instructions, 5 robot models to choose from and unique sensors for each robot. The robots you can build with Lego Boost are Vernie the Robot, Frankie the Cat, Guitar 4000, M.T.R. 4 and Auto Builder. Each of these robots can express certain behaviors. Your kid can use the mobile app on the tablet or smartphone to add his own unique behavior to the robot he has built. Combining the versatile Lego building system with high-end technology, Lego Boost enables your kids to enjoy a huge boost in creativity and skyrocket their innovation. After spending precious hours building the robot using the step-by-step instructions, they can easily download the free Lego Boost app and start the coding process. They can literally bring their creations to life using the simple icon-coding interface and insert an array of emotions and features into each one of their robots. In all the history of toys, mankind has never been able to leverage the power of AI (Artificial Intelligence). However, in 2017, Lego has taken this trend to the next level. 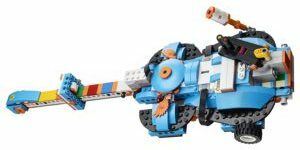 While educational codable toys have seen the light since 2015, when Mindstorms and Wedo 2.0 have gone mainstream, Lego Boost brings a whole new level of personalization. While Anki Cozmo, Jimo Robot, and Cubetto have proven that toy robots can be coded, the Lego Boost educational robotic kit is the definition of interactivity and fun. Lego Boost is the pinnacle of Lego combined with technology and creativity. This Lego programming kit allows kids of all ages (and adults alike) to leverage the power of coding & artificial intelligence. All 5 DIY robots are equipped with advanced AI processors that can expand upon the code they receive and innovate for themselves. Due to the embedded sensors, namely the distance sensor, color sensor and motor, building up the robots becomes as easy as pie. These Lego education kits could prove to be more valuable than we actually perceive at the moment. In addition to increasing your children’s creativity and boosting their self-esteem, this activity can help them socialize more and earn the respect of their peers. To top it all, they can build a long-term companion and might even want to give up that annoying cat or dog in exchange for their new pet friend. Once you receive the Lego boost kit, you will notice that inside it are 840 Lego blocks, the move hub, a motor, two sensors and the instruction manual. The main piece of resistance is the move hub, which contains the six-axis sensor, two output and two input ports, a light and an on/off button. The hub is powered by six AAA batteries, so make sure you have plenty of those in your home before ordering the kit. This is the lead model, a funny guy who cracks jokes, walks around and even dances. Your kids will definitely fall in love with Vernie. Who needs a real cat when he can have a gorgeous pet that plays, purrs and even expresses its mood? This gorgeous guitar could provide enough leverage for your kids to start playing an instrument. Your kids can actually use the guitar to create their own music. This robust rover can be loaded with 4 different types of weapons for maximum warfare impact. Definitely the choice of boys. Lastly, the Auto Builder is the choice of creative kids who are passionate to start their own robot production factory. With it, you can automate the process of building mini Lego robots. Definitely a model to try. With over 840 Lego pieces to choose from, you can be sure that your children will never get bored of designing their own robots. Now it is time to get deeper into Lego boost and discover what it has in store for you. Do not forget, this is a Lego for kids, so most of its features target kids of between 7 and 12 years of age. However, anyone over 7 can have tons of fun with this product and can dive into the world of Lego coding. Once your kid installs the app on his smartphone or tablet, he will be asked to create a “Getting Started” vehicle. That is a demo that includes 3 blocks of Lego put together. This tutorial walks your kid through the basic creation process, enabling him to become familiar with the features and the hardware. The coding interface is a simple drag-and-drop modules that connect directly with the vehicles. After the tutorial, your kid can choose his preferred type of robot from the 5 available and get to work immediately. Depending on his skills and abilities, it might take anywhere from one hour to a full day to build a robot from the scratch. The app will show your kid how to build the robot step by step, so no worries here. With Vernie the Robot, for example, you will first design his head and then go down to the torso and feet. With the guitar, you are building the base first and then add the “strings”. The apps takes over once the robot is ready, assuming its unique personality. The robot, with its personalized character, asks for your name and begins to interact with those around. Do not expect that to happen from the guitar or the M.T.R 4. By far, the most intriguing character out of the 5 is Vernie the Robot. He comes with a lot of charm, moving his head when talking and doing smart gestures with his hand. He can also shake your hand. Most of these aspects are already embedded inside the soft, so you don’t have to program them. Thus, Lego boost is much easier to use and friendlier than Mindstorms. Once completed, you can start coding the robot and add extra features to its personality. Your kid can dive into the activities in the app and personalize their robots. For example, your kid can easily attach a moustache to Vernie or enable it to wear a gun. As your child plays through the activities available, he will discover more about coding. The more activities your child will perform, the more modules he will understand about coding. Lego Boost is amazing indeed as it is. However, what makes it exquisite is the fact that you can actually use it together with your own Lego bricks. For instance, if you have a Lego Ninjango set in your home, you can definitely use it together with Boost. 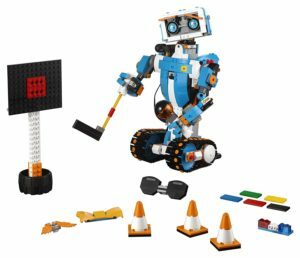 With this Lego robotic kit, you can enable your child to bring his own creations to life and to capitalize on the multiple benefits of coding for kids. You have probably heard before of Lego’s Wedo Educational tool that offers similar functions. However, the main difference in a Lego Boost vs Wedo showdown is that Wedo is focused on STEM education, while Lego Boost revolves around augmenting the Lego building experience. In simpler terms, Lego Wedo and Wedo 2.0 is perfect for large classrooms, with small models that can be easily taken apart, while Lego Boost is an excellent coding educational tool at home. Lego Mindstorms, also known as Mindstorms EV3, is a fantastic robot building kit for kids over 10 years of age. Compared to Lego Boost which is more affordable and less tricky, Mindstorms could easily challenge even the most experienced of adults. Mindstorms is also a great choice for kids who have the basic concepts of coding or for adults who want to test their skills. Out of these 2, Lego Boost is the better choice, as it includes more models, has a friendlier app and is much easier to understand. Plus, it is cheaper. Why Invest in Lego Boost? If you are not yet convinced that Lego Boost is an excellent gift for your kids this Christmas, then you should read below some of the reasons why you have to invest in this Lego robot. This product fills a huge gap in the home robotics market. 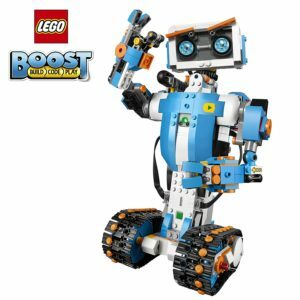 While Mindstorms and other robotic kits are suitable for kids over 10 years and with a minimal coding experience, Lego Boost is excellent for kids over 7 years who didn’t have the opportunity to code anything else so far. Until now, kids between 7 and 10 years of age did not have a suitable Lego robotic education kit at their disposal. One of the biggest benefits of Lego Boost is the social one. This tool enables your child to team up with his peers and start design amazing robots. Once the robot is ready, he will also want to interact with his creation. That’s definitely a much better way to socialize than through social media or gaming. Building robots and learning to code has been proven to increase the creativity and to skyrocket intelligence. By investing in Lego Boost, you are investing in your child, helping to prepare his mind for success in the future. Lego Boost, the latest creation of one of the most loved brands in the world, is an absolutely awesome gift for kids aged 7+. In addition to helping your kids enjoy all the mental benefits of coding and robot building, you can also ensure that they spend their time doing something meaningful. This gorgeous Lego robotic kit is available for pre-order now and will be ready to ship in August 2017.